The Uzbek man who killed eight people in New York City came to the United States on a diversity immigrant visa. After the attack, President Donald Trump announced he wants to work with U.S. lawmakers to end the Diversity Immigrant Visa Program. The diversity visa program is known as the green card lottery. It is the only hope for some would-be Americans to live in the United States. The program is open to non-refugees, individuals with no family members in the U.S. and those lacking an employer willing to guarantee them a job. To be considered for the program, a person must have a high school education or a few years of work experience. Natives of most countries can qualify, but there are exceptions, such as Bangladesh, Brazil, Canada, China (mainland-born), Colombia, and the Dominican Republic. The list also includes El Salvador, Haiti, India, Jamaica, Mexico, Nigeria, and Pakistan. Also included are Peru, the Philippines, South Korea, the United Kingdom and its territories except Northern Ireland, and Vietnam. People born in Hong Kong, Macau, and Taiwan qualify for the diversity lottery program. Between September 2015 and September 2016, the U.S. government approved 45,664 diversity visas. More than 2,300 of them were given to Uzbeks. Senate minority leader Chuck Schumer helped to create the legislation for the program in the 1990s. Schumer is a leading member of the Democratic Party. Trump has blamed Schumer and the Democrats for the terror attack in New York. In a statement, Schumer said “I have always believed and continue to believe that immigration is good for America.” He also asked the president to support the “real solution” of anti-terrorism financing, which would be cut under the most recent budget proposed by the Trump administration. 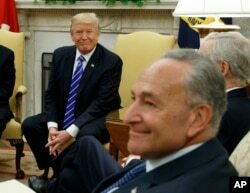 President Donald Trump and Senate Democratic Minority Leader Chuck Schumer are seen during a meeting with other Congressional leaders in the Oval Office of the White House in Washington, Sept. 6, 2017. Schumer was also one of eight lawmakers who wrote the Comprehensive Immigration Reform bill in 2013. The bill would have ended the green card lottery. The measure passed the Senate, but the House of Representatives did not vote on it. Leon Fresco formerly served in the Office of Immigration Litigation at the U.S. Department of Justice. He worked there during the presidency of Barack Obama. Fresco developed the legislation in 2013. He noted that cutting the lottery program was part of a compromise between the two main political parties. President Trump has called for a new immigration system, one that is based on merit, not family ties. The United States currently has a family-based immigration policy. The immigration system is based on sponsorship. A U.S. citizen or green card holder can offer to accept responsibility for family members who leave their home country to move to the U.S.
Partners and young children qualify as immediate relatives and do not need to wait for a visa number. But for brothers, sisters and adult children, the process can be long and difficult. “It's extremely difficult…brothers and sisters are at the very end," said Naomi Tsu, deputy director for the Southern Poverty Law Center. Tsu said it is even harder if they live in countries that have a lot of immigrants coming to the United States. The nonpartisan Migration Policy Institute reports that in 2015, more than 1 million permanent residents were admitted to the United States. Of that number, 44 percent were immediate relatives of U.S. citizens, and 20 percent entered through a family-sponsored preference. Only 14 percent entered on job-based visas. Merit-based immigration would give preference to non-citizens with high-paying job offers, past successes, English-language skills and education. All of those would be considered under the proposed green card system. The higher the rating, the more likely an immigrant would be admitted to the United States. This system would be similar to merit-based immigration systems used by Canada and Australia. Supporters of a merit-based system say it would help lower immigration rates. And they say it will ensure that the immigrants who do get accepted are highly skilled and less likely to need public assistance. In August, Trump said that the United States has “operated a very low-skill immigration system.” He was speaking in support for a bill known as the RAISE, Reforming American Immigration for a Strong Economy, Act. It aims to cut legal immigration from 1 million to 500,000 each year, in part by moving to a merit-based system. “This [family-based] policy has placed substantial pressure on American workers, taxpayers and community resources,” Trump said. But critics say the U.S. economy also needs low-skilled workers, and a merit-based system would hurt industries that depend on them. VOA News reported this story. Ashley Thompson adapted it for Learning English. George Grow was the editor. diversity - n. the quality or state of having many different forms, types, ideas, etc.